So far this winter has been fairly non descript for large parts of the US and Canada, following a chilled November temperatures have been much above average so far this winter with snowfall also falling behind the pack; however are there signs of a change into January? A “roller coaster ride” of temperatures is forecast for the Mid West, Great Lakes and North East over the coming 7 days with the next shot of intense cold likely to arrive in the Great Plains on Wednesday and extending into the North East later in the week. 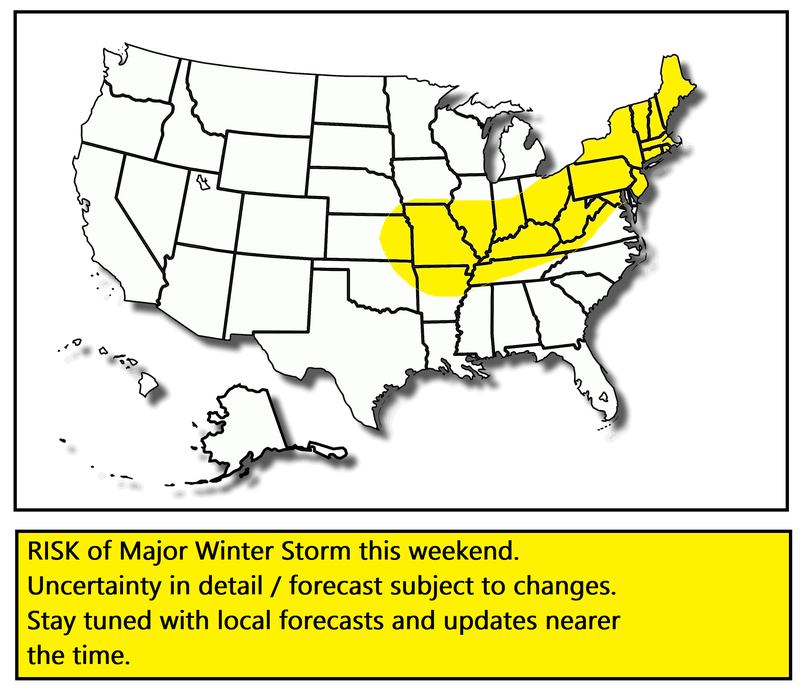 As milder air attempts to push in during the weekend, there is a risk of a significant winter storm. Confidence: Low (Forecast subject to changes). Areas at risk: Outlined below. Time frame: Friday 11th through Tuesday 15th January 2019. As we are talking about a few days away, confidence is fairly low, and the forecast could change – however as it stands some central parts of the U.S ie Missouri, through northern Kentucky, perhaps southern Illinois, Indiana and Ohio, and stretching up to the North East of the US south east of the lakes for example Pennsylvania, but from West Virginia to Maine, is at risk of this significant winter snow storm from say Friday the 12th to Tuesday the 15th of January 2019. Please keep a close eye on local forecasts for that time frame if you live in the areas mentioned, although forecasts for this potential snow storm could change in the next few days, this poses a significant risk to travel etc. The GFS weather model is forecasting anywhere between 20 and 30cm for large parts of the east whereas the ECMWF has a smaller area impacted by the snow. So there is uncertainty with regards to a) the extent of the area that will be affected by snow and b) the intensity. However the risk has been outlined. Stay safe. This entry was posted in Uncategorized on January 7, 2019 by admin8.